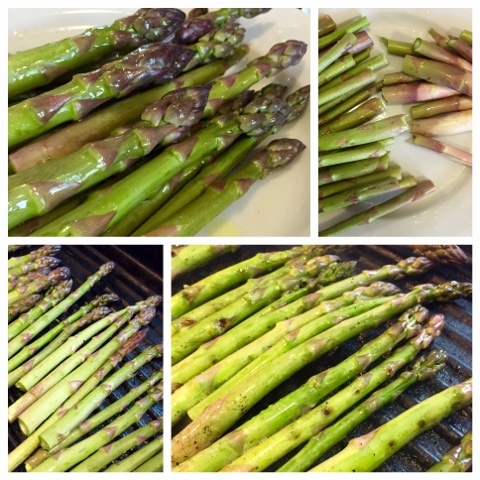 Since it is asparagus season in New Jersey and we get the best from our local farms, I'm pulling out a few classic asparagus recipes to share as well as one from Viereck Farms. Most can be adapted to your speific needs - such as my elimination diet. I'll have a soup recipe to share in a few days too! First up, a classic roasted or grilled asparagus. You can use your outdoor grill, an indoor electric grill, a panini press, a stove-top grill pan or you can roast the spears on a sheet pan in the oven at high heat. salt and freshly cracked black pepper. Snapped off the woody ends and tossed the stalks onto a sheet tray. Drizzled a bit of olive oil over it, a few grinds of black pepper and a dusting of kosher salt. Pop these babies into a preheated oven and roasted them for about 15 minutes. Turn them once after about 5 minutes. You want to attain a bit of caramelizing but not a char. Come spring and summer, try grilling the spears over medium heat for an even more wonderful sweet smokey flavor. You will never want to suffer through soggy limpid asparagus spears again. Or serve with fresh, finely zested lemon and a few shaves of Parmegiano Reggiano. Recipe #2 of my Favorite Spring Meal - Home Made Pasta with Asparagus and Lemon Sauce. It's not spring without the bright flavor and vibrant green asparagus that heralds the coming of the new season. This part of the recipe is fast - it takes 20 minutes to make and makes enough sauce to serve 4. To round out the meal, serve it with a spring mix salad with balsamic macerated strawberries and sweet and spicy pecans. Serve a saute of julienne carrots and snow peas as a bright and colorful accompaniment. Or if you wish, seared scallops, sauteed shrimp, poached salmon or thin slices of grilled chicken are nice full proteins to add to your meal. The pasta can be served as either a side or as an appetizer. The original recipe was found in Gourmet Magazine, May 2000. It contains only 5 Ingredients! adapted from a recipe by Faith Heller Willinger. 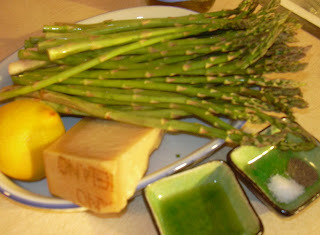 Cut asparagus into 1-inch pieces. Reserve asparagus tips separately, for garnishing. Bring a large (4-6 quarts) pot of water to a rapid boil. Add 2 tablespoons of salt and the asparagus stems to the pot; cook for about 6 minutes, or until tender. Remove the asparagus stems with a slotted spoon, or small strainer; transfer the asparagus stems to a colander and rinse under cold water. Keep the cooking water for cooking the pasta and the asparagus tips. 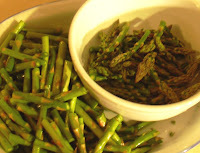 Drain asparagus stems well and transfer to a food processor or blender. 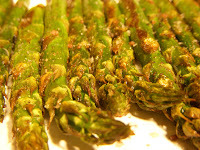 Cook asparagus tips in same boiling water until just tender - about 3 minutes. Reserve the cooking water to cook pasta. Rinse the asparagus tips under cold water and set the tips aside. In a blender or food processor, puree the asparagus stems with the lemon zest, lemon juice, olive oil, Parmesan cheese and 1/2 cup asparagus cooking water. 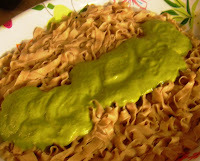 The puree should be smooth and bright green. Add a pinch of salt and a dash of freshly cracked pepper. Adjust your seasonings according to taste. The cheese is salty, so use salt sparingly. Into the same pot of water you cooked your asparagus, cook the pasta until it is just al dente. Fresh Pasta takes about 3-4 minutes to cook. Before you strain the pasta, reserve 2 cups cooking water. Drain pasta – but do not rinse. Using the same pot, add the puree mixture and cook over high heat to re-warm the sauce. Add the cooked pasta to the puree. If the sauce is too thick, use ½ cup of the reserved cooking water at little at a time to thin the sauce. The sauce should coat the pasta and be a bit loose. Add the asparagus tips to the pasta, stir to incorporate throughout. Serve pasta with a garnish of lemon zest and a sprinkling of the cheese. Serve immediately. The last asparagus recipe comes courtesy of Viereck Farmes, of Swedesboro and Woolwich Townships, NJ, by way of The Blue Plate in Mullica Hill, Chef Jim Malaby. That's a whole lot of courtesies! Les, of Viereck Farms had this recipe as a hand-out flyer on the Collingswood Farmers' Market opening day, last Saturday, May 7th. I have used zucchini in chocolate breads, cakes and cupcakes, I've even seen recipes using avocado, but I had not thought to use asparagus in a cake before. Les told me that if you have a basic batter recipe, you could inter-change it with a variety of vegetables; spinach, zucchini or squashes like butternuts or pumpkins. I've made a few tweaks to the recipe, to make it a tad healthier. I'd love to experiment further with this recipe, taking the sugar down, swapping out the oil for unsweetened applesauce, maybe even swapping out buttermilk for non-fat Greek yogurt. If you try any variations, do let me know! Fill cup cake pans with liners. In a separate bowl mix the remains 1/4 cup of flour with the chocolate chips and set aside. In another bowl mix together the wet ingredients - combining the buttermilk, oil, eggs and vanilla. Mix on low speed until they are incorporated. With the mixer on low speed, slowly add the wet ingredients to the dry. With the mixer still on low, add the coffee and still just to combine, scraping the bottom of the bow with a rubber spatula. Add the grated asparagus and the reserved chocolate chips, folding gently to incorporate. Pour or scoop the batter (using a spring-loaded ice-cream scoop) not the cupcake liners and bake for 15017 minutes, or until a cake tester comes out clean. Cool in the pans for 20 minutes, then turn them out onto a cooling rack to cool completely. Alternatively, you can grease and flour a large (9x5) loaf pan and bake this as a loaf cake. Bake for 45 minutes to 1 hour, rotating the pan after 30 minutes. Bake in the center of the oven, with the rack fitted into the center slot. 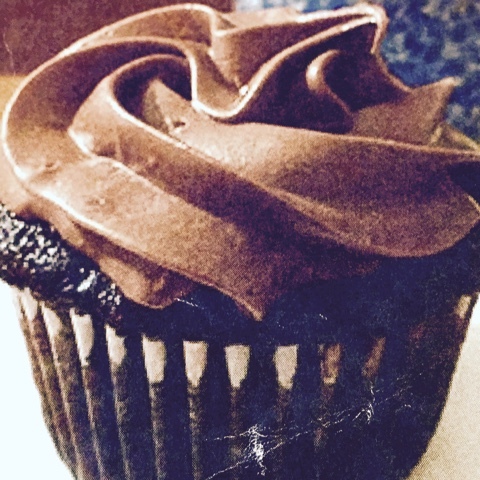 For an easy chocolate frosting, whip one can of chocolate frosting with 1 8 ounce bar of softened creamcheese. So sweet. Our Market bloggers are reading one another's posts! Did you know each other before this new project? And have I mentioned how tickled I am at how well things are going so far? Donna - I truly don't know if you can taste the asparagus. Les gave me the recipe. My take is probably a little bit. When I've made this style cake/cupcake w/zucchini, I can't taste it at all, it just makes the cake moist. As long as the asparagus is well grated and not in chunks, I suspect it would blend right in. The two kinds of chocolate - cocoa powder and chocolate chips will do much to mask that distinct asparagus grassiness!